"Poor is the nation that has no heroes . Shameful is the one that, having them, forgets." The Silence About six miles from Maastricht, in the Netherlands, lie buried 8,301 American soldiers who died in "Operation Market Garden" in the battles to liberate Holland in the fall winter of 1944-. Every one of the men buried in the cemetery, as well as those in the Canadian and British military cemeteries, has been adopted by a Dutch family who mind the grave, decorate it, and keep alive the memory of the soldier they have adopted. It is even the custom to keep a portrait of "their" American soldier in a place of honor in their home. Annually, on "Liberation Day," memorial services are held for "the men who died to liberate Holland." The day concludes with a concert. The final piece is always "Il Silenzio," a memorial piece commissioned by the Dutch and first played in 1965 on the 20th anniversary of Holland's liberation. It has been the concluding piece of the memorial concert ever since. An Awesome American Military Song! Elvis Presley's America the Beautiful! We will fight for thee!" President George Bush quoting the words of the Citadel's school song on December 11, 2001. What God Might Say: Don't Worry! At Kids' Wings, we are concerned with the deterioriating condition of the character in our country. Traditional values and standards are under attack by a few and suggest disintegrating ideals to our youngsters. 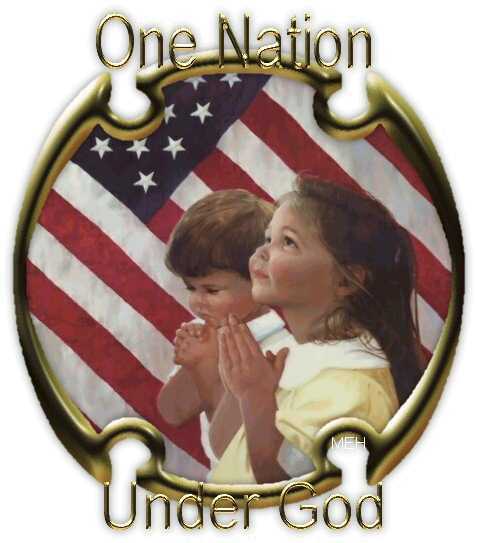 We pledge allegiance to ONE NATION UNDER GOD! We carry money that states IN GOD WE TRUST! Why, then, is His name so often treated as the enemy in our classrooms? Why are we more likely to hear His name used in cursing than in reverence? When we waver in our allegiance and our trust, we weaken our country's foundation. It is NOT illegal to say God's name in our classrooms; yet, that is the message our children are getting. If the character of our country's kids seems to be getting lost, someone is forgetting to give them direction! The main direction is UP.... We're doing it to ourselves! 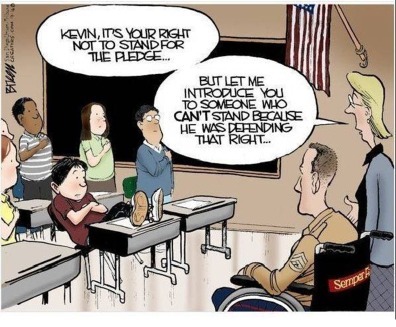 Take God from our Pledge of Allegiance? Not on our watch! We ARE ONE NATION ONLY as long as we remain UNDER GOD!